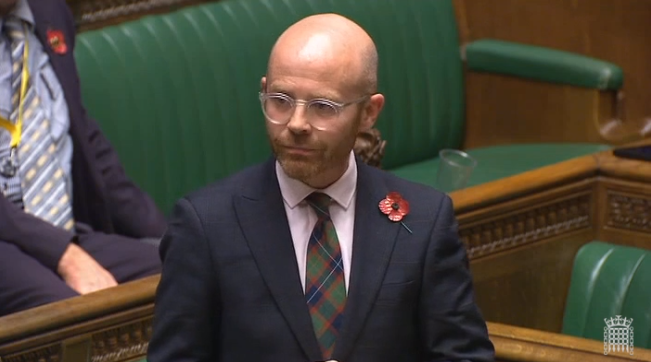 Martin Docherty-Hughes, MP for West Dunbartonshire, has paid tribute to those who have lost their lives in conflict ahead of Remembrance Sunday. The SNP MP spoke in a House of Commons debate commemorating the Centenary of the end of the First World War. The debate took place after parliament had been suspended to allow MPs to attend an Armistice remembrance service at St Margaret’s Church in Westminster. Leading the debate on behalf of the SNP, Martin Docherty-Hughes said that the sacrifice of everyone who lost their lives in WW1 must be remembered, paying tribute to his great uncle James who fell on 29 September 1918. The MP for West Dunbartonshire called on parliamentarians to commemorate the military and civilian casualties of war by committing to peace which he said will allow democracy to flourish. “The greatness of war is the greatness of loss, and only as time passes do we come to understand the profound and unintended historical consequences of those individual loses. “As we commemorate the end of the First World War, let us remember that the victory of war was no solace to those lost. War comes about for many reasons, but at the end of it are always the dead – both military and civilian. Martin Docherty-Hughes MP will be attending commemoration services taking place across West Dunbartonshire on Remembrance Sunday to mark the end of the First World War.